Make yourself at home in one of the 14 air-conditioned rooms featuring flat-screen televisions. Complimentary wireless Internet access keeps you connected, and cable programming is available for your entertainment. Bathrooms have bathtubs or showers and complimentary toiletries. Conveniences include ceiling fans, and housekeeping is provided daily. Make yourself at home in one of the 38 individually decorated guestrooms, featuring DVD players and LCD televisions. Cable programming and video-game consoles are provided for your entertainment, while complimentary wireless Internet access keeps you connected. Private bathrooms with shower/tub combinations feature deep soaking bathtubs and rainfall showerheads. Conveniences include phones, as well as safes and desks. Take in the views from a terrace and a garden and make use of amenities such as a fireplace in the lobby. This hotel also features tour/ticket assistance and a picnic area. Make yourself at home in one of the 15 air-conditioned rooms featuring LED televisions. Complimentary wireless Internet access keeps you connected, and cable programming is available for your entertainment. Bathrooms have showers and complimentary toiletries. Conveniences include safes and coffee/tea makers, and housekeeping is provided daily. Enjoy international cuisine at The Sitting Elephant, a restaurant where you can take in the ocean view, or stay in and take advantage of the 24-hour room service. A complimentary buffet breakfast is served daily from 7:30 AM to 11 AM. With a stay at V Resorts Rajaji National Park in Lansdowne, you'll be 7.9 mi (12.8 km) from Triveni Ghat and 9.3 mi (15 km) from Ram Jhula. 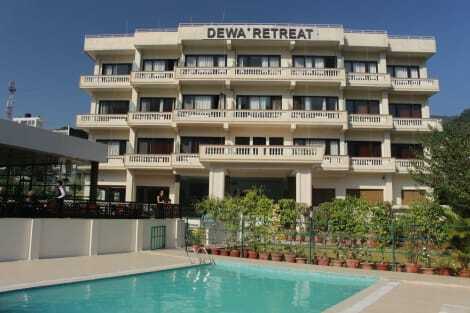 This hotel is 10 mi (16.1 km) from Har-ki-Pair Ghat and 10.3 mi (16.6 km) from Har Ki Pauri. Make yourself at home in one of the 30 air-conditioned rooms featuring refrigerators and minibars. Rooms have private balconies. Complimentary wireless Internet access keeps you connected, and LCD televisions are provided for your entertainment. Private bathrooms with showers feature complimentary toiletries and hair dryers. Featured amenities include a 24-hour business center, express check-in, and express check-out. Guests may use a train station pick-up service for a surcharge, and free valet parking is available onsite. lastminute.com has a fantastic range of hotels in Rishikesh, with everything from cheap hotels to luxurious five star accommodation available. We like to live up to our last minute name so remember you can book any one of our excellent Rishikesh hotels up until midnight and stay the same night.